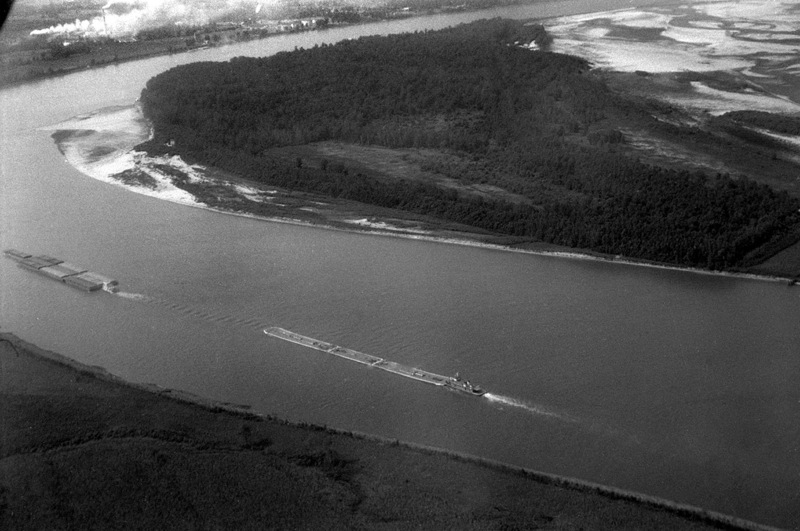 These northbound towboats pushing a string of barges were off Marquette Island south of Cape Girardeau when I shot them sometime around 1964. The white smoke at the top left is from the cement plant. Click on the photo to make it larger. I’m still recovering from the data drive that went south. The backup restoration has been running for more than 24 hours and has recovered all but about 10,000 files out of 487,776. It’s still churning away, but because the rebuild is taking 99% of the CPU cycles, memory and disk access, everything else is running like that nightmare I have from time time time: the one where the bad guys are chasing me, but I’m running like I’m in a swimming pool full of molasses. I think I’d prefer that to a slow, non-responsive computer. I hope things will be back to normal by Tuesday morning. River shots are great and shots from the air are so rare. Until we had Google earth it was hard to see the inter-relationship between Thebes and Scott City. Who knew they were across the street (river) from each other instead of miles and and miles away on Highway 3#. I remember well the smoke, or more the dust from the cement factory. I lived on the north side of town and anyone living on the south could tell you have the dust coated your car with a thick concrete like stuff each night.